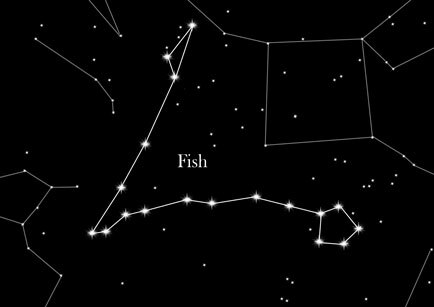 Pisces, also known as 'The Fishes', is one of the most singular and interesting constellations which can be viewed from Earth. Pisces is a very unusual constellation. As one of the signs of the Zodiac, it is situated on the ecliptic line, or the level of planetary orbits. This means that the Sun, Moon and planets of our Solar System appear to move through the constellation on occasions when it is viewed from Earth. Pisces is a very large constellation in terms of the area in the night sky it covers. Despite its large area though, it is not easy to see, especially in urban areas. Its brightest star, Alrischa, has a magnitude of just 3.5. Stargazers can use the constellation Pegasus, known as the Autumn Triangle, to help them locate Pisces, as this is situated nearby. With its long shape, Pisces often reminds contemporary observers of a scooter. Greek mythology tells of Zeus killing his father Kronos, and waging war against the Earth Goddess, Gaia. Zeus imprisoned Gaia's children, the Titans, and as a result the Earth Goddess created the monster Typhon to wreak vengeance on Zeus and the gods of Olympus. This monster had a hundred dragon heads and was so fearsome that even the goddess Aphrodite was overcome with fear. She threw herself into the River Euphrates to escape, and there was rescued by two fish. As a tribute to the heroic deed of the fish, the goddess immortalized them in the night sky as Pisces. Other legends insist that the constellation is the skeleton of the sea monster which Perseus defeated to save Princess Andromeda. Astrological significance: Pisces is a sign of the Zodiac, and anyone born February 21 to March 20 will have The Fish as their astrological sign. Pisceans are generally regarded as being social and lovable, though also perhaps a little dreamy and occasionally chaotic. They are often talented artists who possess a shy charm. The element of Pisces is water.